I am Whedonesque in doing so. I believe in all things Whedon. I know I haven't been around as much as back in the day, but this place is still my online home as far as I'm concerned and, as my Caption Tightpants players know, real life has gotten in the way often. My dad, John Sr., has been ill for quite some time, and he passed away early yesterday morning, 10.23.16. Now I know many of you know I am an avid Browncoat, did everything in my power to get the word out back in the day, which included (after much Serenity Valley level of motivating) getting him to give it a chance. He finally watched it, and marathoned it in two days, and decided Jayne was his favorite. He was always supportive of my Browncoat efforts (and shenanigans). He loved the show, and loved my love of it. Just one of the many things he and I shared in life. 06.16 14:54 See? 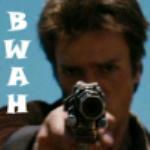 Can't keep a good Browncoat down! 12.31 15:51 Been out of the world for a spell. GRAPHICS HAPPY U-DAY! Bonus Apples to Griswold Cards! GRAPHICS Apples To Griswolds game now available!!! GRAPHICS TCM's Cargo Bay Ball Boardgame - Coming Soon! GRAPHICS Dong Ma? Extender Pack 01 - Now Available! GRAPHICS Big Damn BWAH! card signed by Summer! GRAPHICS Big Damn BWAH! Card signed by Alan! GRAPHICS BWAH! The Vampire Slayer - Coming Soon! GRAPHICS Operating w/o Core Containment! GRAPHICS Fruity Oaty Bar: The Card Game?!?! YES! GRAPHICS Girl's pitchin' a fit...GORRAM REAVERS are here! GRAPHICS GORRAM REAVERS! They're here or they're comin'! GRAPHICS Ball Failure? Read the sign, friend! GRAPHICS 3 Skulls for your Mule! GRAPHICS BWAH! Can't Stop The Signal is now available for FREE! GRAPHICS the NEW BWAH! And *YOU* could name it! GRAPHICS GORRAM REAVERS! a game on the edge! GRAPHICS Reaver Elf in Action! GRAPHICS Wishing you a Miranda Christmas! GRAPHICS GORRAM REAVERS! A "freeform boardgame" coming soon! GRAPHICS FIREFLY Is Life. The rest is just details. GRAPHICS The Serenity Movie Site Wallpaper Designer is up! GRAPHICS HARD BURN coming soon from TCM! GRAPHICS Slap this on your Bumper Panel! GRAPHICS BWAH! Local Color NOW AVAILABLE FOR FREE! GRAPHICS BWAH! It's the Terrifyin' Space Monkeys! GRAPHICS BWAH! Local Color expansion coming soon! GRAPHICS My own hull markings! GRAPHICS BWAH! Gorram Plans... NOW AVAILABLE! FOR FREE! GRAPHICS Kiss me I'm Fireflyrish! GRAPHICS A most memorable scene on a T-shirt! GRAPHICS Where I lay my head to dream of Serenity! GRAPHICS How to make cheap yummy props for a shindig! GRAPHICS My shiny new Firefly gear! GRAPHICS Serenity, like protein, in all the colors of the rainbow. GRAPHICS The ugly one, sir. GRAPHICS What are you wearing to the BIG DAMN MOVIE? GRAPHICS Over 100 products and counting!!! GRAPHICS Jaaaayne....the KID they call Jaaaaayne! GRAPHICS Personalizing the Dead Fish style T! GRAPHICS BWAH! the Firefly Cardgame...now in playtest! GRAPHICS The newest vacation spot in the 'Verse! GRAPHICS HEY! Yer under arrest for illeeegul parking! GRAPHICS Sneak a peek at my newest card game idea: BWAH! GRAPHICS Shiny! Ruttin' Gear for the Gorram Election! GRAPHICS Finish making your replica Jayne Dead Fish T-shirt! GRAPHICS Do YOU want a copy of THIS game for FREE? GRAPHICS "Cilantro! ", says Joss. Now that is some kinda quote! GRAPHICS Property of Gorram Reavers - in time for Halloween! GRAPHICS OOPS! Repost of "Property of Atherton Wing"
GRAPHICS Trading Cards from the Cincinnati Shindig! GRAPHICS Cincinnati Shindig: A Mighty Fine Group! GRAPHICS Are you a Mudder? Then you should be in one of these! GRAPHICS Gosh, dead fish can look cool on a T-shirt! GRAPHICS Some Serenity banners...feel free to use and abuse 'em! GRAPHICS Maybe someday this will be our official slogan? GRAPHICS My newest fun T-shirt design for those in deep space! GRAPHICS BDHs -- What that really stands for! GRAPHICS A lovely parting gift...thanks for paying! GRAPHICS Your posters in the Firefly universe!!! GRAPHICS Invitation repost for Cincinnati SOBs and more! GRAPHICS Simon says, "Go mad." GRAPHICS RiverDance...c'mon, you know you thought it too! GRAPHICS Niska's Skyplex...it's educational...really, it is! GRAPHICS THE WOMEN OF FIREFLY WALLPAPER! GRAPHICS Best ruttin' wallpaper of the best gorram pilot in the 'verse!